A permanent memorial to commemorate the veterans of Bomber Command is to be unveiled after a 60-year campaign. Veterans from Bomber Command have wanted a permanent memorial to mark the deaths of 55,000 RAF men who died during the war's bombing campaigns. But questions over the ethics of bombing missions have prevented a memorial or medal until now. 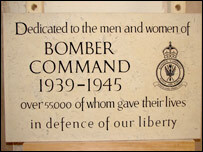 A stone, carved by stonemasons at Lincoln Cathedral, will be dedicated to Bomber Command at a ceremony on Sunday. Former RAF navigator from 100 Squadron, 90-year-old Douglas Hudson, who is taking part in the dedication ceremony, said the memorial was long overdue. "There has been no public recognition of Bomber Command and we have even been branded criminals by some people. "I would invite anyone who feels like that to get into a confined space in a bomber then have the doors close on a flight that's five, six or seven hours long while people constantly try to bring you down. "I think it's so important to have this memorial, as Lincolnshire was renown during the war as Bomber County, so it is long overdue," Mr Hudson said.